These factors combined to stress lawn and gardens beyond what we expect to see in an average summer. Evapotranspiration rates rose to 0.2 – 0.25 inch per day. That means the soil was losing a quarter inch of water each day through evaporation and plants transpiring water. Just to maintain soil moisture levels, a sprinkler system would have to apply 1.75 inches of water each week. 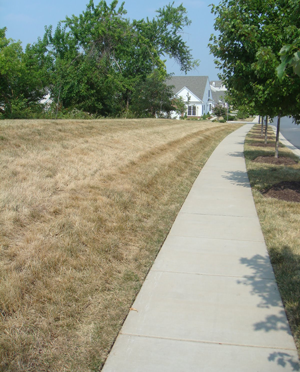 To decide what’s causing your turf problems, see if your lawn is uniformly stressed, or if you notice spots of brown interspersed with healthy green lawn. If your irrigation system is typical, the program likely runs three times a week during the summer, 10 minutes for sprays and 30 minutes for rotors. This adds up to about 0.6 inches of water applied to your lawn each week, sufficient for a typical July. 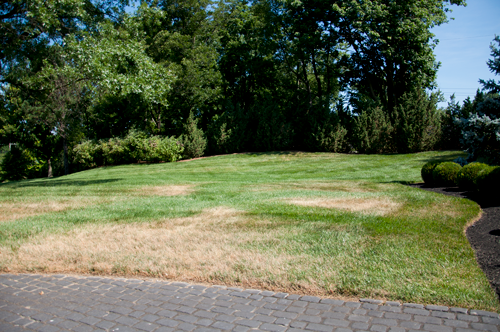 But in this hot, dry, low-humidity July, your lawn may be turning brown even with a fully-functional sprinkler system. Plants are durable and can handle limited drought exposure. The best approach for keeping your turf and gardens beautiful is to begin adding days to your schedule when you see your plants starting to stress. Don’t wait too long to add the days, and scale back if you start to notice signs of over-watering. If keeping a keen eye on your landscaping sounds like too much time and hassle, consider installing a Hydrawise Smart Controller. 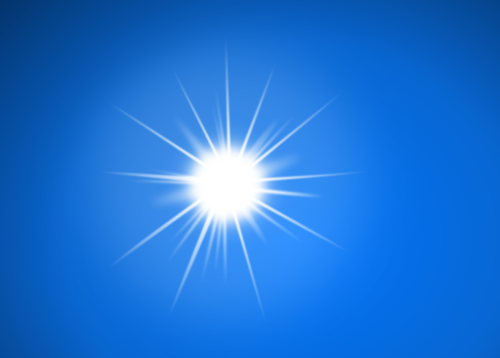 Its predictive watering feature monitors local weather stations to estimate how often to water your lawn and gardens. If only parts of your lawn are experiencing stress and turning brown, there could be other factors at work beyond under-watering. If you’d like some help troubleshooting your lawn problems, give us a call at 513-379-5780. Sometimes the answer is as simple as running certain zones longer and more often than others. Our Summer Check-Up identifies any inefficiencies or weaknesses in your sprinkler system to keep your lawn and landscaping looking its best.